What difference does policy make? Craig Morris says that a comparison of the low prices for installed solar arrays in Germany with more expensive arrays in the US is a good way to start answering that question. Typically, whenever the Anglo press speaks of German policy support for photovoltaics (PV), we read of things like lavish subsidies (Nature) and generous feed-in tariffs (CNN). So how does that sound when compared with the chart below? The prices for US arrays were taken from RMI’s Electricity Grid Defection study, while the German data come from Fraunhofer ISE (PDF). The German prices in euros were converted into USD at the historic average exchange rate by quarter year. Here, we see that the price of a completely installed solar array has been and continues to be considerably cheaper in Germany than in the US. The gap seems to have been around two dollars all along. Now that the price in Germany has fallen to two dollars, solar is now twice as expensive in the US as it is in Germany. The reasons behind unnecessarily expensive PV in the US are interesting, and I (along with the Lawrence Berkeley National Laboratory) have written about them before. In a nutshell, the installation process in the US is laden with red tape, making a residential PV array as complicated as an infrastructure project – whereas solar rooftops in Germany are as uncomplicated for homeowners as any other roof work on your own home. One obvious recommendation would therefore be for the US to do what Germany is doing. But we have to first properly understand what Germany is doing. Some leading US solar proponents have claimed that the US should replicate Germany’s budget for solar power, yet Germany has none. Furthermore, US-style net-metering does not make homeowners any more independent than feed-in tariffs do. The real difference is that German policy pays for kilowatt-hours (the electricity generated), not kilowatts (the number of panels installed). The price was relatively high a few years ago not only because solar panels were expensive, but also because Germany has relatively little sunlight. The same panel installed in Dubai will produce around twice as much electricity, so solar power in Germany should cost twice as much. The price for the sale of a kilowatt-hour of solar power to the grid is thus guaranteed in Germany. However, your profitability is not guaranteed; that depends on your array’s performance. It has to be installed and maintained properly. How different policy is in the US! In a celebratory article, RMI praised the rise of North Carolina as a “solar energy leader” last month. The Tar Heel State is now fourth in the country in terms of installed capacity. The authors celebrate the state specifically for building all that solar without raising retail power prices. North Carolina does so by not paying for this solar with surcharges that affect power prices. There is a 30 percent federal tax credit for solar, and North Carolina adds on another 35 percent. Essentially, you only need to pay for a third of your solar array in North Carolina; you can write down two thirds. And you even get a refund if your overall tax burden drops into the negative. The policy does not primarily incentivize the generation of electricity (kilowatt-hours), but the number of installed solar panels (kilowatts). The tax credit itself does not reward you for properly installing your panels or, say, quickly replacing a failed inverter (a device used to connect solar panels to the grid). There is a small incentive for proper power production, however. Solar power producers receive compensation for their electricity sold to the grid at the avoided cost rate for the utility. Here, solar power offsets fuel costs for the utility at some power plant, so solar homeowners are compensated in that amount, which is a pittance. But in the process, the utility does not post major losses from the policy – and hence does not oppose it. The losses are there, however. They are just hidden. As the chart at the top of this article indicates, Americans continue to overpay for solar. So if the costs don’t affect utility bottom lines or retail rates, where do they end up? Let’s take a look at the most egregious example: my home state of Louisiana. In 2008, I was asked to present the German policy scheme to the Louisiana Public Service Commission, which was debating what would become the country’s most generous support scheme for PV. While North Carolina adds a 35 percent tax credit to the federal tax credit of 30 percent, Louisiana heaps on 50 percent, meaning you only have to pay for a fifth of your solar array. The result was 151 million in costs to Louisiana taxpayers by the end of 2014 for a mere 65 MW installed. The state tax credit therefore amounts to around $2.50 per watt, and it only covers half of the upfront installment price – so a solar array in Louisiana costs around five dollars per watt, around 25 percent more than the US average and some 150 percent more than the German average. The amazing thing is that so few Louisianans realize their state is practically giving away solar roofs; the state’s installed capacity was only a tenth of North Carolina’s at the end of 2013 despite the clearly better financial terms. Perhaps that outcome is fortunate; if the policy were more successful, the dramatic cost impact would be even greater. Already, the Louisiana Tea Party is calling for an end to the state’s solar tax credits, which it calls crony capitalism. The good news is that the price of a solar array in places like North Carolina is falling rapidly and is now around $2.50 per watt. Deployment clearly brings down prices, as both the US and German markets demonstrate. Tax incentives can indeed successfully reduce turnkey prices by developing a market of installers. But so do German-style feed-in tariffs, which are paid to solar investors. In turn, they go shopping among installers, thereby putting downward pressure on system prices on a market. North Carolina’s solar policy has built up this market without raising opposition from local utilities and without raising retail rates. It did so by hiding the actual excessive cost of PV in the already strained state budget, just as the federal tax credit is a burden on the drastically overdrawn federal budget. German policy puts all of those costs on power bills, and the impact has been noticeable – but the days of expensive solar are over. Last year, PV made up nearly a third of newly installed renewable generation capacity but only accounted for an eighth of the cost. Those who implement German-style feed-in tariffs today face only slight increases in power rates. In return, you truly get the cheapest solar because a competitive market of suppliers is created – and there are no hidden costs in public budgets. The renewable energy surcharge in Germany is an easy target for critics, but Americans should ask themselves: what do we want to defend, an overbloated but partly hidden price tag – or the real one that is much lower? Good Posting Craig. 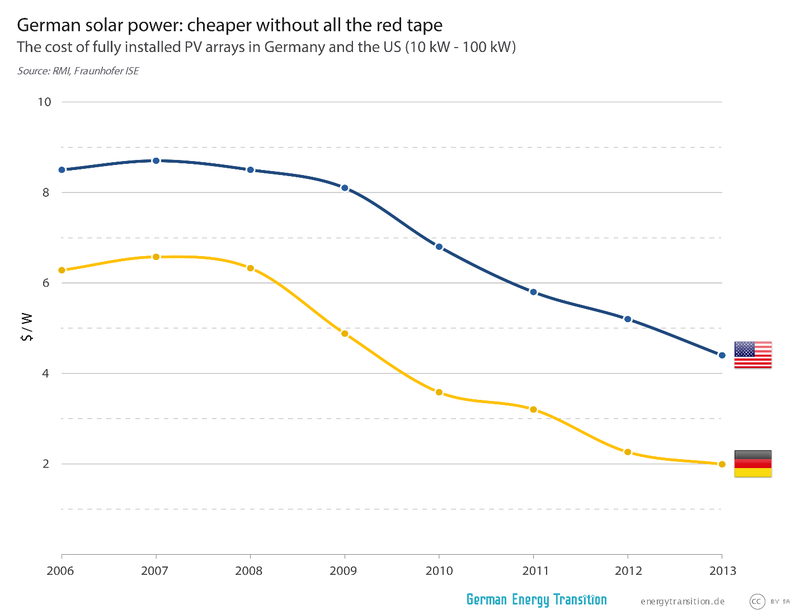 Several weeks ago, Barry Cinnemon posted something similar in Renewable Energy World, but delved more into the specifics as to why “soft costs” installed solar more than double the price of solar installed in the U.S. over solar in Germany. it is the “paperwork”. In the U.S., there are wellover 400 utilities,and as many different states and municipalities — each with their own “paperwork”bureaucracies. Sometimes over200 pages formulas have to filled out for a rooftop installation in the U.S. and the form to fill out for a German installation is only one page. It is the ” soft costs”. It is important to understand that the prices for the LBNL study were not collected nationwide… but only in a couple of states that REQUIRED the detail collection and reporting of the prices IN ORDER to qualify for the states rebates/tax incentives. If I remember correctly it was California and New Jersey. Drawing conclusions that the price for installation EVERYWHERE in the US is twice as high as German install costs is not accurate. And part of that red tape the installers don’t like… that includes the detailed reporting to obtain the tax incentives. It is also worth noting that in California a third party owner/installers (TPO) – such as SolarCity are common – the financing of solar systems in Germany using TPO’s during the time the LBNL study was made is nearly non-existent. TPO’s add cost on top of the normal purchased installation. And we’ve seen hints (IRS investigations) that some of the TPO’s may have been inflating the final system cost as a means to increase their tax incentives.. I think it is really VERY important for readers to also understand that there isn’t a single US style of net-metering. The rules and implementation vary significantly from state to state. AND they vary with in the state depending on how the utility choose to implement the net-metering within the laws of that state. Implying that there is a “US style net-metering” is pretty much like arguing that the German FiT is the same for all forms of renewable energy… be it onshore wind, offshore wind, biomass, geothermal, solarPV or hydro. Each Country has their own system of taxation. In Canada, we have a Capital Cost Allowance, which allows businesses, such as farming, to deduct a percentage of purchase costs for equipment, over several years. It varies from industry to industry. The trucking industry has its own percentage of Capital Cost deduction credits and so forth. But, each business has this business operational deduction. So, if I’m harvesting wheat or sunshine (energy) I don’t see a problem with offering tax credits/incentives. If the Utility wishes to purchase any over-production of wheat (energy excess), then that number should reflect current costs of generating local power….. remembering that new nuclear, hydroelectric power, gas fired power plants and associated infrastructure doesn’t come for free…. pre and post dismantling. And takes years to bring online. Furthermore, places like Florida should be happy to save the costs on their mobile solar panel installations, which they can move north to GA, as fixed power plants will soon be under water. Now that’s an incentive, by any other name!